This is a personal motto that I TRY to live by every day. Having dealt with a chronic and often debilitating illness for over 17 years, I’ve slowly but surely realized that a lot of how I feel depends on what I eat (or don’t eat). The Standard American Diet (SAD) just doesn’t work for me, nor should it. These days, I eat mostly vegetables and drink green smoothies – basically sticking to an 80/20 alkaline/acid diet. I eat very little dairy, meat and grains – no wheat or sugar (the biggest challenge), and feel better than I have in a long time. 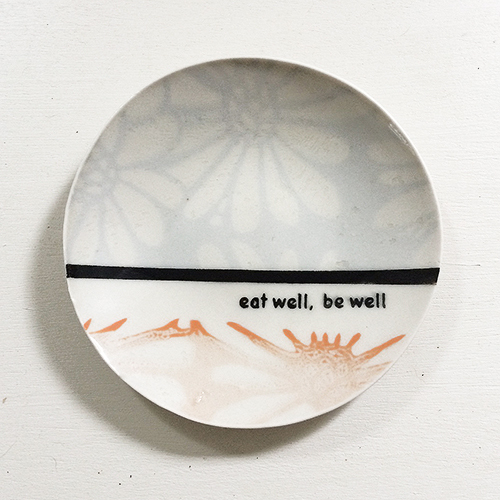 Beautiful plate with perfect message. I applaud your strength in following a diet that is healthy. I try but it is hard especially when eating out.